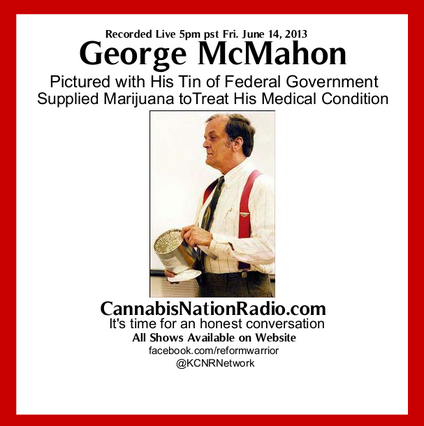 George McMahon is one of the remaining patients still enrolled in the Compassionate IND program (Investigational New Drug), run by the Federal Government. He was first enrolled in the program back on March 16th, 1990 with a diagnosis of Nail-patella syndrome. Suffering with pain, spasms and nausea (and as he says, “In that order”) all his life, George was prescribed heavy amounts of pharmaceuticals, taking 17 different prescriptions, which included 400 morphine tablets a month! Having being admitted to the hospital several times due to side effects, enduring 19 major surgeries, and being declared clinically dead five times, George first started to realize the benefits of marijuana one night back in 1988 after being admitted back into the hospital. He was offered a joint by one of the orderlies who had gotten it from a terminal cancer patient that wanted to swap it for a cigarette. After barely eating for 6 weeks and not being able to sleep, the first thing George did after smoking it was finally manage to eat something. Which was quickly followed by a well needed nap. Upon being woken from his nap by his hunger, George had quickly started to put two and two together. From there, there was no turning back. In the past George was hospitalized several times for side effects of prescription drugs. George now takes no prescription drugs, and controls his symptoms by smoking 10 joints of marijuana daily. Starting back in 1997, George began speaking on a national tour, taking the opportunity to talk about his experiences with medical marijuana, as well as surgical and pharmaceutical maltreatment. Also co authoring a book in 2003 called Prescription Pot: A leading Advocate’s Heroic Battle to Legalize Medical Marijuana; George talks about his personal trials on the road to becoming a leading crusader for the legalization of medical marijuana. From his own personal pain and suffering, and what marijuana has done for him, to presenting his case before the Supreme Court and Congress. George takes us through the story, putting a human face on this controversial, pressing issue. In 2012 George was the vice-presidential candidate on the Grassroots party ticket with Jim Carlson. Jim Carlson, of Duluth Minnesota, is a longtime business owner of the embattled 'Last Place On Earth'. This 'Head Shop' and Adult novelty store has been a Duluth institution for over 30 years, however now, the city and ambitious, publicity-hungry politicians, are trying to put him out of business using dubious tactics. "To have 35-40 agents hold guns up to people's heads, just because they're shopping in a store, and throw them down on the ground, make them lay down face-first, and then hog-tie them, and then sit and question every one of them, is as un-American as anything I've...I mean would they ever do that at Target or Walmart." Remember in the past when the feds raided health food stores at gunpoint for selling "stevia," the natural herbal sweetener? Stevia has neither calories nor carbohydrates, is suitable for diabetics, and doesn't cause tooth decay. Yet for years health food stores were raided at gun point, books about stevia were burned, and products containing stevia were destroyed. The history of stevia in many ways parallels the history of medical marijuana and hemp. It should also be noted that in the early 90’s George was awarded the Certificate of Heroism from the presidents Drug Awareness Program in honor of his personal campaign to promote medical marijuana. It was signed by Nancy Reagan, the mother of the "just say no" campaign.